First off, Cults on Thursday was, oddly, the first time I'd been to Venue since it changed from the Plaza. I didn't think it was possible for the sound to be any worse than it was pre-renovations, but, hey, I've been wrong before. Pretty solid performance marred by godawful sound. The band had their own sound guy but the opening band, who used the in-house guy had similar problems, so I'm going to chalk it up to the room. 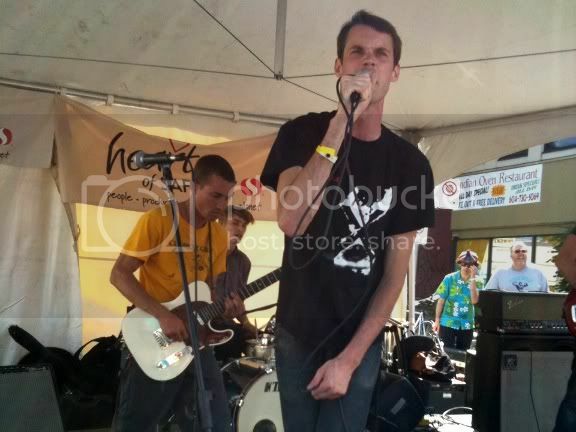 Second, hopefully you made it out to Khatsalano on Saturday. It was gorgeous out and the music stages, curated by Zulu, made it like Music Waste (if it were one day, free, and in Kits). There's a pic of B-Lines up there playing where I'd never expected to watch them, at the corner of 4th and Maple. Wednesday, I made it down to the Biltmore for Junior High. The relatively new (it started in June) monthly features 90s hits (which I'm more into than I realized) from the "Gal Pal" DJs and last night they welcomed Love Cuts, who played a short, but sweet set. They weren't super tight, but they've got some good (and a couple great) songs, notably this one. This weekend looks to be a busy one. There's the Neverland Boat Cruise tomorrow, Needles & Pins/Peace at the Astoria and Chains of Love's release party at the Biltmore after that, while Saturday sees Scratch/Interurban hosting a huge record sale in the afternoon, Goody hosting and outdoor BBQ with 7 live acts, another outdoor show at the Waldorf with Iceage, Cults of Youth, White Lung, and Nu Sensae, an early Ty Segall show at the Biltmore, plus late shows at the Astoria and Pat's. So, if you're sticking around town, go see something besides fireworks. Oh, and if you're not busy tonight, come to this fundraiser. I'm playing some records with Dustin. Dan Moxon's playing a solo set of mostly covers, and a bunch of other cool performers are doing there thing as well. Oh hello, neglected blog. I would blame it on the summer weather, but let's not kid ourselves. Anyhow, here's a random assortment of catch up points. 1) The Vic Square Block Party has a date: September 4th... which really makes me regret agreeing to stay an extra night in Whistler after the wedding I'm going to on the 3rd. For everyone else, they've already confirmed via Twitter that Sun Wizard are playing, with, of course, many more acts to come. 2) Cam Reed has a new night at the Astoria called You Could Do Worse Wednesdays. No live acts (yet), but it's $2 and, really, if you're looking for something to do on a Wednesday, you could do worse. The first one was last night (I was at the Biltmore, so I wasn't there) and it runs every two weeks. 3) Speaking of the Biltmore, last night's Rock n Roll Pizza Party was the second time I've caught Blondewich live and I'm pretty stoked on them, particularly the garage-punk/girl-group hybrid "Boom Boom," which they closed with last night. 4) If you're not skipping it in favour of Cold Cave/Austra, TVOTR, or Thurston Moore/Kurt Vile, you're officially reminded that Cults got moved from the Waldorf to Venue.